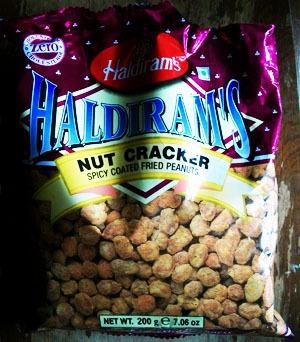 I’m not usually a big fan of peanuts but as a fan of Haldirams I gave their Nut Cracker product a try. It comes in that odd 7.06 oz packet. They’re described as a “Spicy coated fried peanuts.” They are very tasty. They may be a little spicy for some though – the chili powder figures prominently. The coating provides a very pleasing crunch. A few go a long way as they pack a lot of flavor. It would work well in a homemade Muri type of mix.